I started Crocheted Candy based off of my passion for making clothing and my love for making women feel good about themselves. When I was overweight I suffered abuse from people who were prejudice against me for it, and when I lost all of my weight I noticed a significant change in how people treated me and it made me very sad. My purpose with Crocheted Candy is to make lingerie, swimwear, and festival wear for women that will make them feel good and beautiful in their own skin, no matter who they are. I hope that my designs have helped women achieve their own self confidence and a genuine love for themselves! 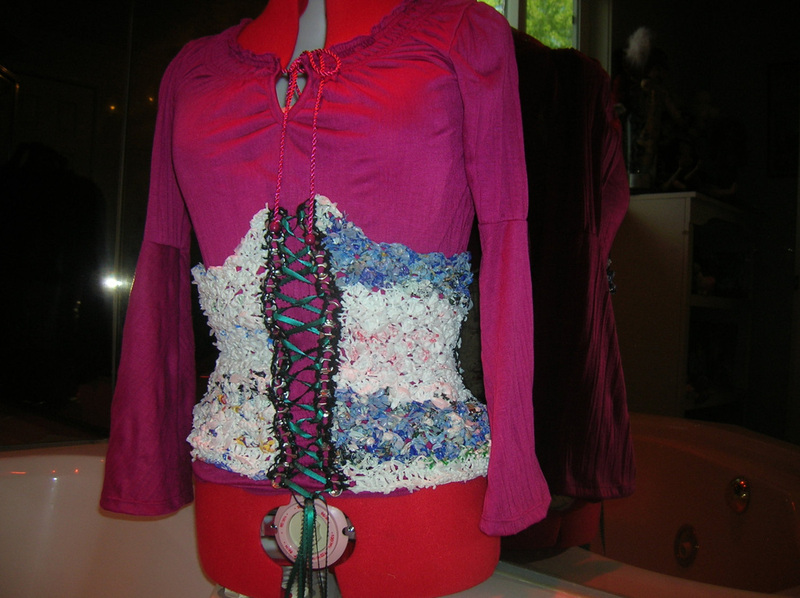 Currently I am working more on tops that are designed to go over a blouse and especially over a corset. I think that these pieces are beautiful and they are designed to make a woman stand out while still being ultimately comfortable and adjustable. What make my shop, Crocheted Candy, ultimately unique is that I make all of my pieces completely adjustable for any body type, therefore removing the idea of numbered sizes or even just sizes in small, medium, large, etc. I believe that this has a large part to do with undermining women's self esteem and by removing those labels I am fighting to make sure that I can make a difference in every woman's life. I have begun to completely change my vision for my shop on Etsy, "Crocheted Candy". Rather than fully doing lingerie and bikinis I have switched to doing clothing more for fun costuming such as corsets and caplets, but I am making them so that they can be worn everyday and add a new fashion sense for women. I want to make every woman feel beautiful and unique and I am now designing clothing that will be more flattering for every body shape and size - no matter what it may be. One of my most recent pieces is a corset that I made from plastic grocery bags and pop tabs. I cut up the grocery bags and turned them into yarn which I crocheted into the corset and I used the pop tabs for boning. Please check it out on Etsy and be on the look out for completely new pieces coming this month! Right now almost all of my items in Crocheted Candy are 50% off! Please check it out and get them before they are gone! Below are some of the products that are 50% off. To me, every woman is beautiful, no matter their race, size, who they are, what they do, or what their background is. I believe that every woman should believe this and that is why I make lingerie, corsets, and other festival wear and accessories that accentuate every woman's natural figure and allow them comfort while also bringing them confidence. My goal is to make sure that every woman knows they are beautiful and that they don't listen to what the media or anyone else tells them. 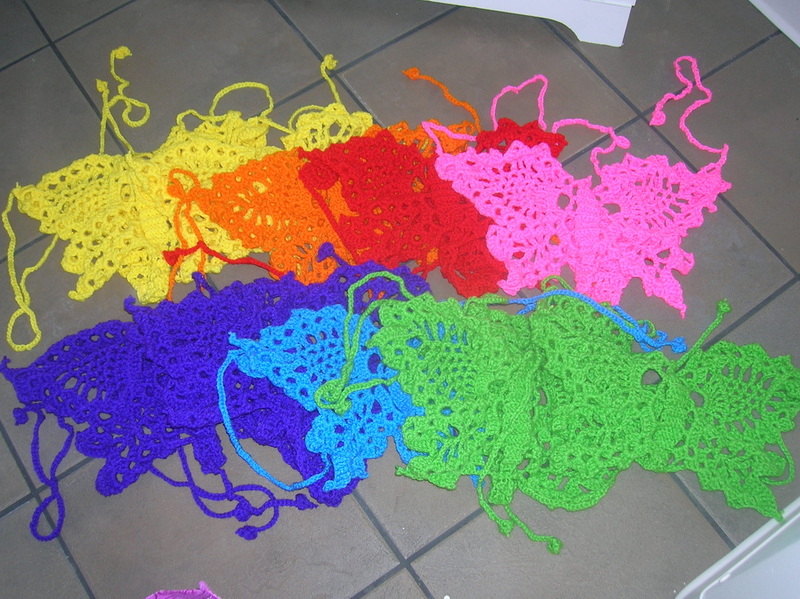 This summer I am completely redoing Crocheted Candy. I have had a large success with my lingerie but I wanted to expand my shop to make clothing for women that they can wear outside of the house and stand out from the crowd. This being said, I am working on a large number of crocheted corsets and tops that can be worn over corsets or even just over a blouse. I think that corsets are beautiful and if they are made right they can be extremely comfortable and figure flattering. I hope that they will be a success and I can change women's lives! Please look out for the new designs coming this Fall! Please also check out my new Thor bikini that I just posted yesterday and my heart bikini as well. The picture below is of my signature butterfly bikini bottoms. I am the owner of "Crocheted Candy" a shop where I make lingerie, corsets, festival wear, and other accessories to help women feel confident in their own skin. All of my designs are from my own patterns or I use vintage patterns to keep that beauty alive.